You are at:Home»DIY»Chalkboard Fun With The Carmel WOW Marker! With Halloween and Thanksgiving right around the corner, what better time is there to dive into some home DIY projects. This guide will provide you with the basics for many fun and creative projects to enjoy the upcoming fall festivities using Carmel’s Wow Marker. The Wow Marker by Carmel offers countless design opportunities to fulfill any DIY project needs. Working on nonporous surfaces such as glass, chalkboards, vinyl, and posters, the Wow Marker is incredibly versatile. Aside from being the perfect art tool, the Carmel Wow Marker is ideal for household applications such as, temporarily labeling glass containers and simply helping to organize the day-to-day with use on a nonporous chalkboard surface. Moreover, unlike traditional chalk, you don’t have to worry about cleaning up chalk dust or hearing that unpleasant sound of chalk on a chalkboard. The Wow markers used Valve technology to release the paint and have replaceable nibs, increasing longevity. Finally, with the fine line, medium point and wide tip nib sizes for the Wow marker, you have the greater precision for your artistic creations. Now, let’s jump into some easy DIY chalkboard ideas so you have the perfect canvass to use with the Wow Marker. The first step in creating your chalkboard is to start with an old (or new) picture frame. Next, you will need to clean the glass surface with a rubbing alcohol or glass cleaner, this will be the surface in which you will be applying the Wow Marker. Then put a piece of white paper inside the picture frame to replicate a white canvas. If the Wow Markers splashes on the frame, if it is nonporous, you can wipe it off with Glass Cleaner or a damp cloth. If the frame is porous apply painters tape to the frame in order to avoid Wow Marker paint from seeping onto the border. Now you are ready to apply the Wow Marker to create beautiful visuals on your favorite non-porous surface (for removability) and porous surface for permanent designs. You can use Carmel’s medium tip permanent Paint Markers on the frame to add a splash of color and detail. Not into painting? No problem! With chalkboard film, such as ChalkTalk® as offered by RTape, you can cut and apply the film directly to any clean and flat surface or directly apply to painted drywall or kitchen cabinets. When you want to change your design concept, the chalkboard film can be easily removed by peeling. This film is also ideal for creating menu boards. Now that you’ve got your canvass, it’s time to start creating using your Wow Markers! Designing lettering stencils are simple and yield professional looking results. You will first need to use a word processing software such as PowerPoint or Microsoft Word. 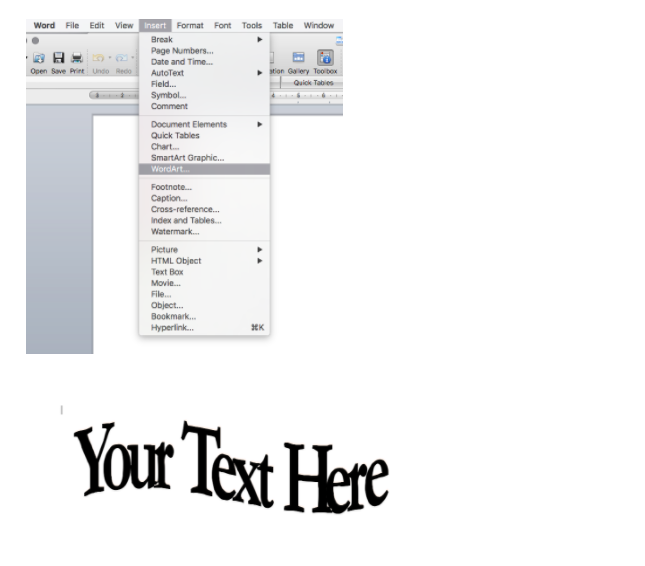 Select the WordArt option and pick your font. Or, if you would prefer to use a premade template, you may download options from resources such as the36thavenue.com/chalkboard-fonts/. Once you’ve decided on your lettering design, print. But note, ensure to print your lettering template using the same dimensions in which you would like your design to appear on the chalkboard. After printing your template, you will need a thin sheet of cardboard and an x-acto knife. Lay your template over of the cardboard and cut out your lettering design. Once you’ve completed your stencil, you are ready to use your Wow Marker to trace out the lettering onto your chalkboard. Essential design tip, for the initial tracing process, utilize the Wow fine tip marker to outline your stencil with greater precision. Then add detail using the medium point and wide tip nib chalk markers! The Carmel Wow marker works with an application on nonporous surfaces, including glass! Gather the family together to create funky Halloween and Thanksgiving designs on the windows. Use the stencil creation techniques mentioned earlier to make some Thanksgiving and Halloween styled designs. Once the fall festivities come to an end, simply use a standard window cleaner to clean and make way for Christmas festivities. When equipped with a nonporous surface and your Wow chalk markers, the possibilities for DIY creations is limitless. Use your picture frame canvass to create calendars, to-do lists, grocery lists, wedding signs, menu boards and more! This is an awesome way to decorate for the holidays! Its also easy to clean up! Recycle that old Picture frame into a chalkboard surface is a wonderful craft idea. I would enjoy this craft with my daughter. Fun to create your own things. I love chalkboard art! This is such a neat idea. I use this Chalkboard in my childhood days.